The fine folks over at Alderac Entertainment Group were kind enough to send me a copy of their Ultimate Toolbox, a book of tables, charts, seeds, and sidebars to inspire and aid the Game Master or player of any fantasy based roleplaying game. This book is far larger than its predecessor, the Toolbox, and is system agnostic to boot. It clocks in at 400 pages, none of which are wasted. Within those pages are over 1000 charts and numerous sidebars that should help any player (Game Master or not) flesh out player characters, non-player characters, cities, governments, religions, dungeons, and plots (just to name a few). The book is laid out into seven chapters and an appendix. Each chapter is also divided into sections conveniently marked in the table of contents. Each chapter ends with a section called Using This Chapter which gives a capstone on implanting the many charts and various sidebar information presented throughout the chapter. This is a veritable mine of ideas, description, and seeds with which to grow your campaign. The utilitarian nature of the Ultimate Toolbox combined with the sheer amount of information provided makes it a difficult supplement to adequately review. So to give readers a better idea about what is contained in this massive tome, I’m going to reproduce the table of contents as well as craft a section of a city using the book. The description below was created after about five minutes of rolling a d20 on several charts in from the Civilization chapter and the Architecture & Atmosphere section. As you can see you can generate some detailed descriptions fairly quickly. I have a theory that the best Game Masters are actually accomplished improv artists. They are able to play off of unexpected player decisions without missing a beat. While this book will not teach you improv, it can prove indispensible as a tool at the table to quickly generate details for unexpected situations at the table, especially if you bookmark likely used tables beforehand. Needless to say, despite the marked price of $49.95, I highly recommend this book. This book will survive the current edition of whatever game you’re playing and prove useful time and again. 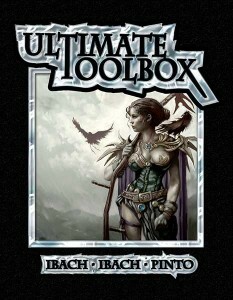 You can shave nearly $16 off the cover price if you pick up the Ultimate Toolbox from Amazon. Sounds like a great resource. Thanks for providing the review. I like that the book is system neutral and designed to provide idea’s and structure. While you reviewed the contents, what are the production values like on the product. As you mentioned the price tag is fairly hefty and while I’m sure the content is worthwhile, it would be nice to know that the physical product itself has been published at a good standard. .-= Wimwick´s last blog ..Skill Challenge: Babysitting the Brats =-. I’m very interested in this book, that was a great example you created with its charts, I could see that being a good backdrop for a series of encounters. Sounds cool. Sadly something like this item is just not in the budget right now. @Bonemaster: That’s why I like Amazon; I can always get stuff on the cheap. @Wimwick: Production values, it is always something I neglect to mention, so thanks for the question. The book is a 400 page perfectbound softcover. The cover is done with a matte finish and is cardstock (much like many splatbooks), so this isn’t something I’d use as a cutting board. The interior is all black and white with minimal artwork. Though I really do like the pen & inkwash style of the artist, Jonathan Hunt (who I believe also did the interior work on the original Toolbox). The pages themselves are crammed with tables, not much space is wasted. There were some editing mistakes, but the utilitarian nature of the information makes those mistakes negligible. The part I’m always concerned about is the binding, but I’ve carried it my bag and thrown this book all over the place for more than a month and the binding is still perfect. The cover has only received minor nicks and dents along the edges. The production values are not anywhere close to a product like the Alpha Omega books, but I don’t get the impression that corners were cut either. It is a whopping 400 softcover tome of information and will wear like one. Anything there on weather? Charts perhaps for different areas of a world? @Gleichman: I don’t have the book in front of me, but I’ll check as soon as I get home. I believe I saw some weather stuff in the Environment section of chapter 2. I’ll post a reply as soon as I find out. @The Recursion King: And I didn’t even use all the tables for that section. While I usually have a very vivid description of primary locations in my head already, I have been using this book to quickly outline alternative locations where the players may go. I also use it to pre-gen several NPCs before each session, just in case the PCs make a point to talk with some “extra” put into the scene. The book has been instrumental in allowing me to roll with the unexptected stuff players do, which seems to be a constant. @Gleichman: There are two weather tables and four environment hazard tables that might interest you, but they are truly random. For instance, “Blizzard worse than most local folks can remember” and “Long term rain has reduced the road ahead to mud and puddles” are on the same table.